Research Project: The main project Christine was involved in while working as a Research Assistant examined the factors affecting the cleaning interactions between the cleaner fish Labroides dimidiatus and the coral trout Plectropomus leopardus. This involved analyses of video recordings and the identification of the ectoparasites of coral trout. 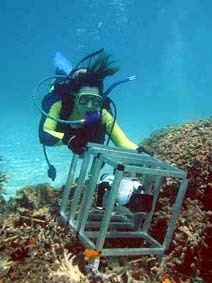 She also worked on a long-term project involving the removal of cleaner fish from reefs on Lizard Island. This required a lot of sorting and measuring of gnathiid isopods from zooplankton emergence trap samples. She also went to Lizard Island to investigate the role of blood parasites in client fish-cleaner fish-gnathiid interactions. Christine also worked on the ectoparasites of damselfish and larval fish. She is currently completing her PhD at the University of New England where she is working on dolphin behaviour.